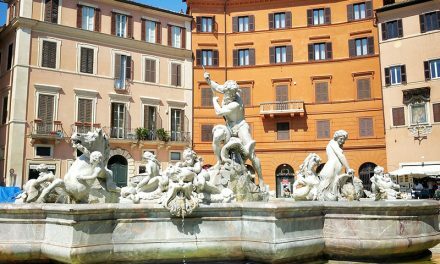 Right in heart of Rome Centro Storico stands the Pantheon, an ancient temple dedicated to the worship of all pagan gods in Ancient Rome. 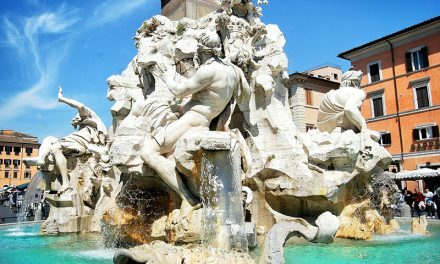 The landmark is one of the best-preserved monuments in Rome and also one of the most visited. 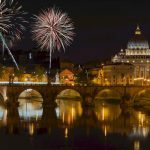 According to data, in 2016 the Pantheon counted more than 7,4 million visitors. Pretty impressive, isn’t it? However, only a few among them actually know that this ancient temple was turned into a church! Indeed, in 609 the Byzantine Emperor Phocas, in memory of whom remains only the Column of Phocas in the Roman Forum, donated the Pantheon to Pope Bonifacius IV. Hence, the pagan temple became a church dedicated to St. Mary and the Martyrs. The quick answer to this question is that “we still don’t know for sure”! Although most of the information about the Pantheon simply suggest that the temple was Emperor Hadrian’s work, reality is a little bit more complicated and there’s no straight answer. 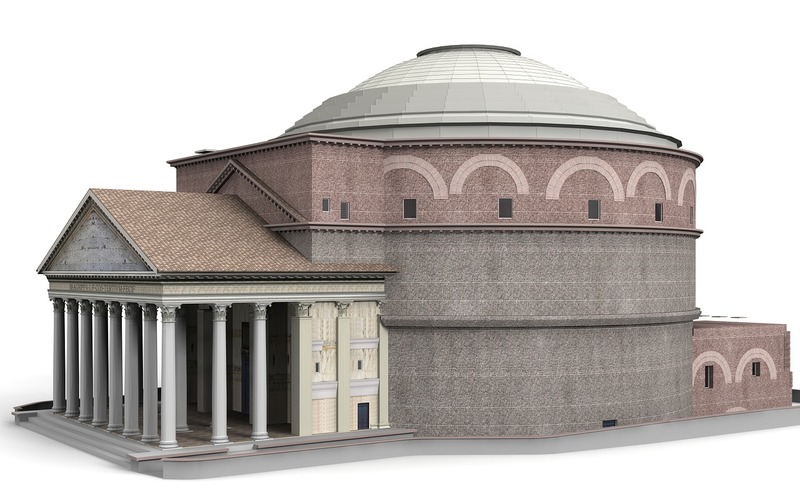 The Pantheon as we know it today is actually a rebuilding of an earlier temple, carried out by Trajan and Hadrian, probably between 114 and 128. Originally, the first temple was commissioned by Marcus Agrippa to celebrate the victory at the Battle of Actium in 31 BC. Some says that Agrippa’s temple was a pretty conventional, Greek-style temple with columns and a rectangular plan. However, new archeological findings suggest that the distinctive hallmarks of the current building were already there at the time of Agrippa. Anyway, what’s pretty sure, is that Agrippa’s Pantheon was severely damaged by two major fires: the first one in 80 AD and the other occurring in 110 AD. Trajan’s started renovation works on the temple, and certainly greatly contributed into shaping the Pantheon as we know it! 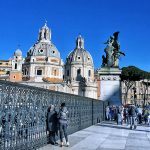 The it came the time of Emperor Hadrian, known to be a great patron of architecture, who follow his predecessor’s work and gave a brand new shape and structure to the Pantheon! 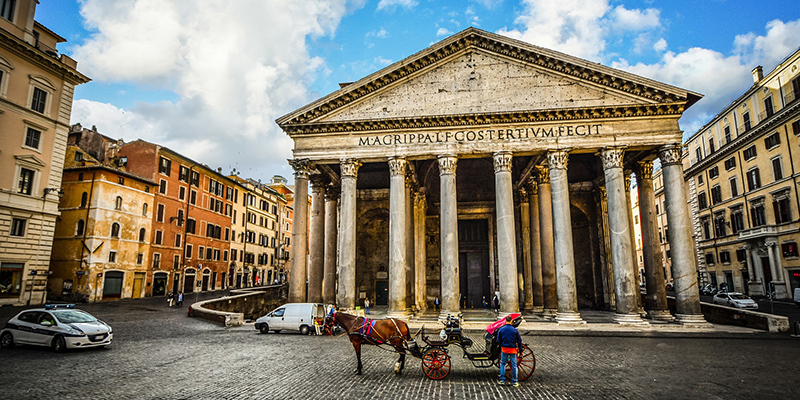 The Pantheon is composed by three main elements: the Portico with 18 impressive granite columns, some of which are made of pink-granite that was brought to Rome from Egypt. Then there’s the Rotunda and the Interior. However, the main element characterizing this amazing construction is “emptiness” or “vacuum” that you can perceive immediately once you’ve crossed the huge bronze doors that measure 7 meters (23 feet) in height. 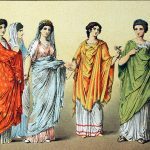 A true record for the Ancient Rome! The peculiar dome, with the giant Oculus (“Eye”) or hole in the middle, contribute to convey a sense of empty space and the feeling to be suspended in the middle of a giant sphere. 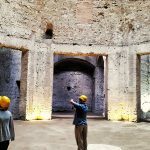 Indeed the diameter of the hall, which is 46 meters (145 feet), exactly pair its height! 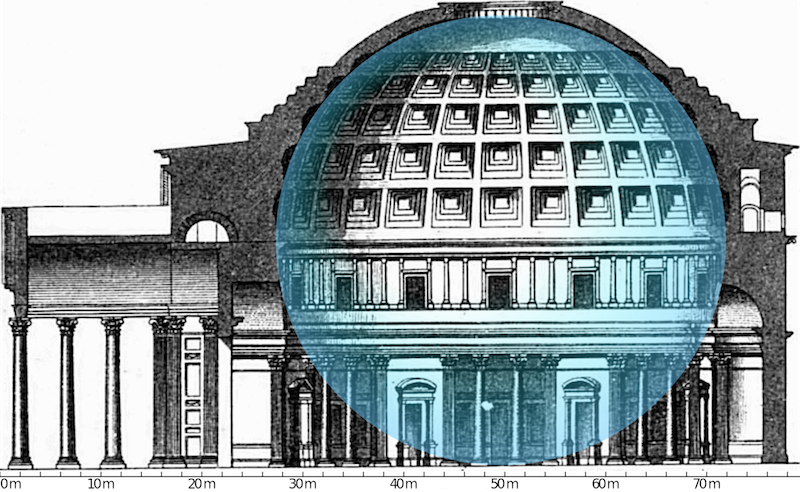 So a perfect sphere can fit with no trouble into the Pantheon! The dome’s panel are divided into 28 sections, pairing the number of the columns below, and five concentric rings. The great Oculus measure nearly 9 meters (30 feet) and is the only source of natural light. And the light is the other main element of the Pantheon, because it contributes to create the inner space and a sense of grandiosity. This is one of the Romans’ great discoveries! 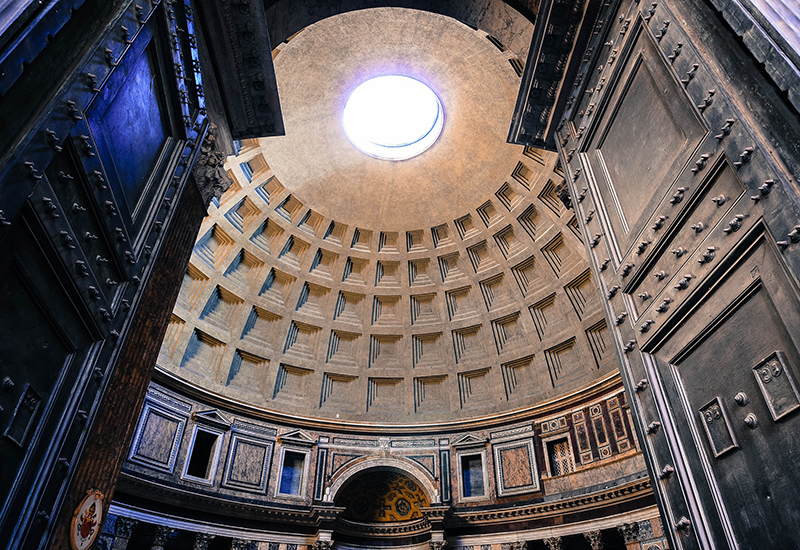 But the true stroke of genius of the architects that built the Pantheon stands in the use of a light weight concrete mix. The walls of the hall are 7-meter thick. The main risk the engineers had to face was that the entire structure would have collapsed under the dome weight. The perfect recipe was found, and exactly as a lasagna, the dome was built one layer on top of the other using different materials. They started from the bottom, using concrete and travertine which is heavier, than bricks, tuff and eventually pumice stone, which is lighter than water! What was the Pantheon used for? This revolutionary monument in the history of architecture and engineering, is still a mystery. 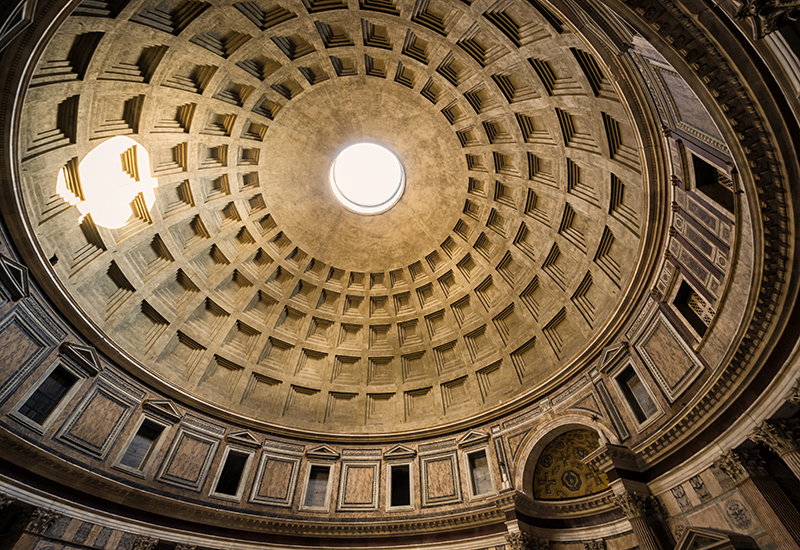 The name Pantheon means “Temple dedicated to all gods”. Statues of gods were placed all around the central hall inside niches. 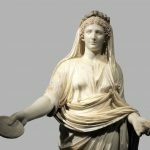 We know that Hadrian was really close to greek culture and so it makes sense he wanted a temple to honor pagan divinities. However we don’t know for sure why the pantheon was built. The emperor held hearings and gave judgment in the Pantheon. So what we can assert for sure is that this great construction was certainly a symbol of the power of the Emperor. As we previously stressed in 609 the Byzantine Emperor Phocas (you can read about him in the article dedicated to the Column of Phocas) donated the Pantheon to Pope Bonifacius IV, and the pagan temple was turned into a church dedicated to St. Mary and the Martyrs. This is probably the reason why the Pantheon is the best-preserved ancient monument in Rome. The inner decorations, the pavements made with precious marbles from all over the Mediterranean are still the same. When you enter the Pantheon you see exactly the same thing ancient Romans saw almost 2,000 years ago. However, some things are missing! 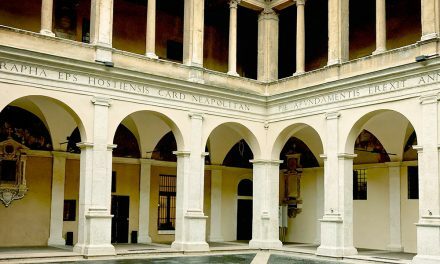 In 1632 the Pope Urban VIII, a member of the Barberini family, had the bronze beams from the portico removed. But the bronze didn’t go wasted. It was used to build another great masterpiece, the famous Baldachin or Canopy by Bernini in St. Peter’s Basilica. 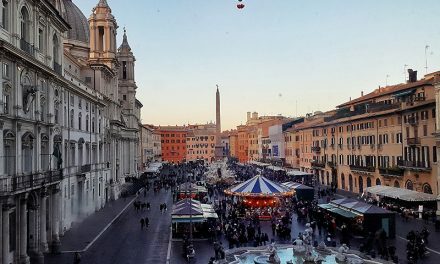 In 1870 the Pantheon became the shrine of the kings of Italy and houses the spoils of Victor Emmanuel the Second celebrated in another great monument The Altar of the Fatherland, Humbert the First and Margaret of Savoy. Also Raphael, the great genius of the Renaissance, is also buried in the Pantheon. Starting from 1995, a rain of rose petals marvel and stupefy visitors at the Pantheon. This Christian tradition is more than 2,000 years old and goes back to the first christian communities in Rome, when the rose was considered a symbol of the Holy Spirit and of the blood of Christ. The magical event takes place every year to celebrate the Pentecost after the 10:30 am Pentecostal Mass. The raining of rose petals fall from the giant eye thanks to the Italian Firefighters Corps. For more information about this Event, check the page Pantheon Info & Opening Hours, and the opening hours section!